Join our online course and learn how to take your graphic recording skills to the next level. Class size: Strictly limited to just 10 places - update: February’s course now full! Imagine being able to capture someone's most important messages and turn them into an engaging picture? Often drawing live and in real time? That's graphic recording. 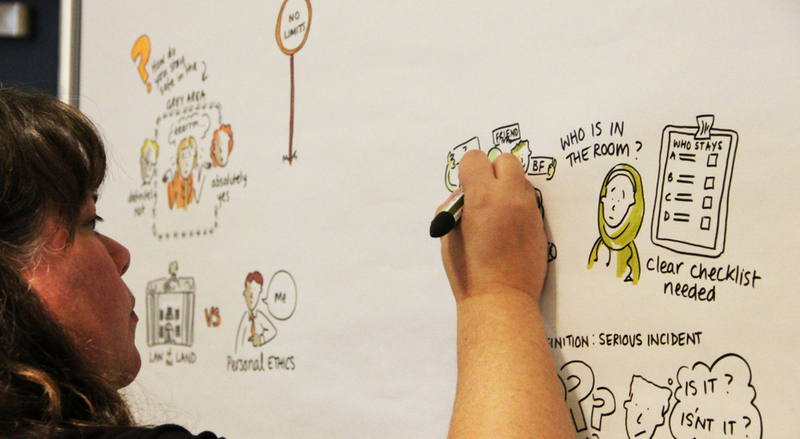 Graphic recording turns the themes and discussions of meetings and events into memorable, engaging, big pictures that can be cascaded through a company, shared with stakeholders and referred to long after the event. Perhaps you're already working visually and want to improve your skills at capturing conversations as they happen. Perhaps you're already a Graphic Recorder and you want to stretch your skills and get some input from an expert. In just 5 hours a week for 8 weeks you can learn the basics you need to become a live graphic recorder. Online. You have a unique opportunity to learn in a small group environment, from one of the most experienced practitioners out there, all from the comfort of your home or office! "I have spent the last 12 years being hired by companies such as Google, TimeWarner, Barclays and the NHS to capture their conversations, ideas and plans into engaging visuals. I know what is involved and most importantly I know where the challenges are because I've been there. February’s course now full - register your interest in September’s course below! Once you've joined you will get a password to access the Graphic Change Academy member space. In the member space you'll find your new course content, the Draw More Boot Camp and the Next Level Boot Camp lessons, as well as other free content to expand your visual thinking mind. I share my experience from over 12 years of graphic recording for clients and give you a series of exercises designed to stretch your thinking and improve your practice. Work in your own time, in just 5 hours a week (recommended). You'll also get access to the private community space for your class. This is where you share your work for me and your class to see, and where you'll get feedback, advice and support to help you get the most out of the lessons. Places are strictly limited so that I can give you individual feedback. Once you have completed the course you will get a certificate. Then go out into the world and Be a Graphic Recorder! 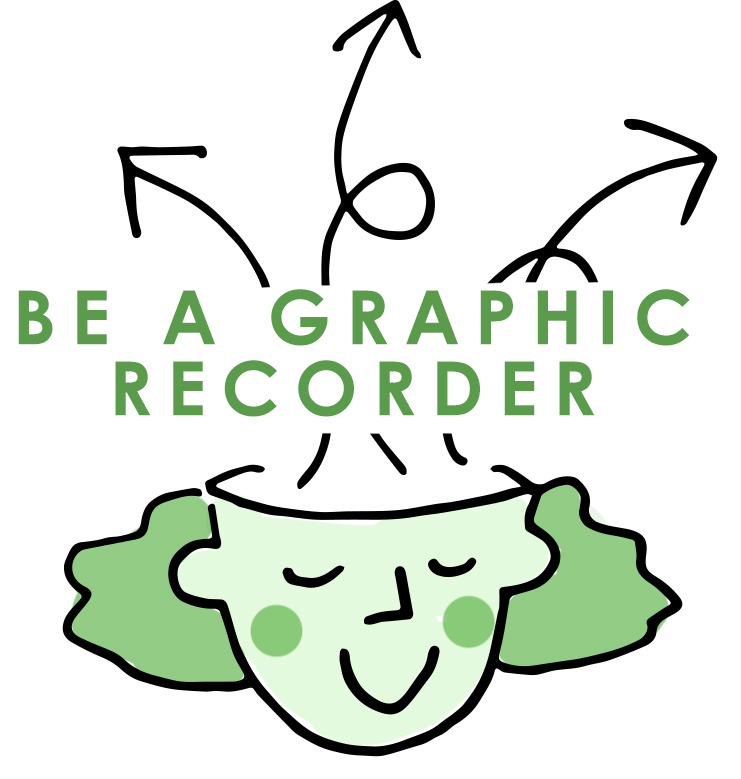 WHY BE A GRAPHIC RECORDER? Working visually is becoming increasingly valued in the work place and Graphic Recording is frequently being used by companies to help them communicate, capture and engage more effectively with their audience. Graphic recording adds a creative edge to meetings and events which makes it easier for participants to tap into their own creative thinking. As the graphic grows people see their experience become part of the visual record, helping them to feel included, heard and valued. Graphic recording creates a memorable summary document that people want to share, keeping valuable information alive in the organisation. If you work within an organisation wanting to capture information creatively, or you want to be a graphic recorder with your own clients, then you will benefit from this course. A series of practical lessons, skills and insights take you on a journey which explores how to create impactful graphic records. Cara Holland shares her 12+ years of professional graphic recording experience with you, and walks you through her process step-by-step. Hands-on exercises and thoughtful reflection will move your graphic recording skills onto the next level, whatever your starting point. Looking at your unique skills and setting your graphic recording benchmark. How to get the most from agendas, and how to set the visual tone. Laying out your page. Content relationships and how you can help your visual page make sense to your audience. Play around with scale and continuity. Finesse your style and learn from some of my real life disasters as a graphic recorder!